Music. Music. Music. In Ostrava yesterday. The bus was still parked next to the shopping mall, as it was ‘rest day’ for the bus. No rest day for the team though! 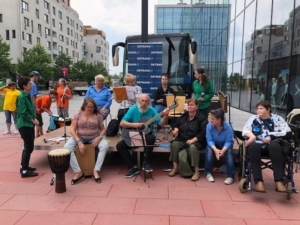 To attract the attention of the people passing by, the Czech network invited several groups and musicians. Some of the groups were from Trigon, an organisation working with disabled people. 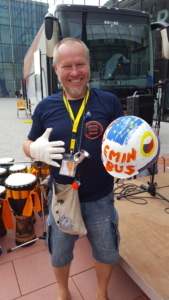 As one of the colleagues mentioned it was quite impressive to see how the people working with this group managed to create a nice performance in which the talents of people with serious disabilities were being used. 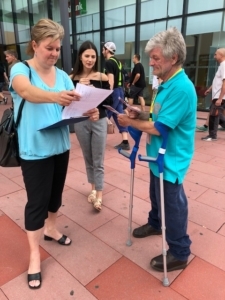 The volunteers (some of them with direct experience of poverty) were present again, and worked very hard to collect signatures, talk to the people, and shared their experiences with us. Although some of them have difficulties walking and standing, because of a disability, they worked so hard all day, and never stopped smiling. I learned that the Czech word for sunshine is ‘sluneční svit’. Respect! Emil, one of these shining volunteer told us that he receives disability benefits, which are apparently not easy to access. You obviously need medical attestation, but on top of that, he can only access this kind of benefit, because he worked for several years. He explains that for other people, this kind of benefit is often out of reach because they cannot proof the necessary work experience. And getting access to services and other kinds of support is quite complicated as well. Without the help of friends, people would be totally lost. His income is very low, but thanks to a friend, he can rent an apartment at half the prize people usually have to pay. And still the rent is taking 50 % of this income! 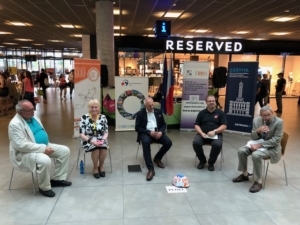 It’s obvious that, without the help of his friend, it would be really difficult to get by with only social benefits in the Czech Republic. When I ask him whether it’s exceptional to receive this kind of help, and find an affordable place to live, Emil himself calls it ‘almost a miracle’. We are in the bus now, on our way to Prague, together with some of the volunteers, musicians, members, activists of the Czech Network!